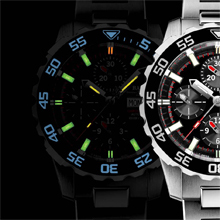 The world’s first diving watch with a helium release valve incorporated into the crown. After presenting a chronometer certified water resistant to the extreme depth of 3,000 meters in 2011, BALL Watch has now unveiled a new major technological innovation in the design of diving watches with the new Engineer Hydrocarbon NEDU. The “Navy Experimental Diving Unit (NEDU)” is the unit of the United States Navy responsible for rolling out operational diving and decompression rules for the United States Armed Forces. It assesses the systems and procedures involved in surviving hyperbaric and diving environments. Applying the same principle of “Safety First” adopted from its very beginnings by BALL Watch for its timekeepers, the NEDU’s experiments have enabled new procedures and new equipments to be developed to increase diving safety. In particular, the NEDU established the decompression timetables that are a vital reference for all divers. In the same way, BALL Watch played a pioneering role in watchmaking by laying down as early as the end of the 19th century chronometric standards used as the basis for the reference today’s standards. BALL Watch has therefore quite naturally dedicated to the NEDU this new model which immediately strikes as being a powerful and characterful chronograph, both sporty and stylish. All aspects of this timepiece have been designed for its use by professional divers for whom each second may be of crucial importance. Attention has in particular been paid to the rotating bezel and its ergonomic contours ensuring precise handling even when wearing diving gloves. The bezel’s unidirectional rotation avoids the dire consequences that could result from any accidental movement when counting down underwater time. Designed in chromed pure black ceramic, the bezel is exceptionally resistant to corrosion, scratches and ultraviolet rays. Additionally, the numerals and graduation have voluntarily been oversized to make them immediately legible. A pioneer in ceramic processing, BALL Watch again uses its innovative application process for powerful luminous paint on the ceramic bezel indications. A fundamental characteristic of any diving watch, the water resistance of this model is guaranteed to a depth of 600 meters thanks to the rugged construction of its case which is 17.3mm at its thickest for a diameter of 42mm. The case back is stamped with a diver motif echoing NEDU’s official emblem. A world first in watchmaking, the automatic helium release valve has been directly incorporated into the crown. This patented BALL innovation has eradicated a potential surface liable to warp under the effects of water pressure, thereby improving the chronograph’s water resistance even further. The crown itself is fitted with a patented protection system that is used on all Engineer Hydrocarbon models. The heart of the watch houses the benchmark chronograph caliber with an ETA 7750 automatic movement that can measure and indicate a lapse of time of up to 12 hours. COSC certification is proof of the absolute precision of the hours, minutes, seconds and day and date display of this chronometer movement. To remain visible even in the darkness of the deep, the dial’s indexes and hands are naturally fitted with luminous micro tubes of 3H gas. This state-of-the-art Swiss technology, the iconic signature of all BALL watches, requires no external source of light or energy while being up to 100 times more efficient than conventional luminous paints. BALL Watch has further improved this process by attaching the dial micro tubes to metal appliques. The new patented process enhances the effect of the micro tubes while also improving the diffusion of the light generated by the tritium gas. The voluntarily restrained design of the dial and the contrast between the graduation, seconds hand and hands on the sub-dials provide the ultimate assurance of excellent legibility of all the indications provided on this model. Another specific feature of this model are the two chamfers cut into the case flange supporting the bezel that act like “drains” to facilitate the outflow of any water that may become lodged between these components. 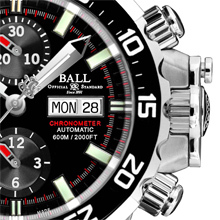 This ingenious addition thought up by BALL Watch also helps combat any possible corrosion effect. The Engineer Hydrocarbon NEDU is also protected from shocks with a force of up to 7,500Gs and magnetic fields to an intensity of 4,800A/m. 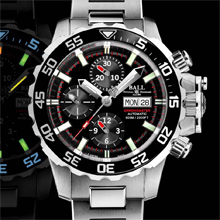 All these protection measures and systems make this a truly robust chronograph. Alongside the rubber strap that is by definition used on any diving watch, this model is also available with a stainless steel and titanium bracelet with BALL Watch’s patented triple folding buckle. The extension system means the watch can be easily and safely worn on the wrist even over a diving suit. With the new Engineer Hydrocarbon NEDU, BALL Watch has again confirmed its undeniable place among diving-watch designers.